When I am really pressed for time, frantic to be exact, and having company in an hour this is what I make. I have the ingredients on hand at all times and count on the embellishments like a special salsa from a local restaurant and homemade guacamole with special cheeses to liven things up. I found the pretty tortilla strips with the croutons at HEB. I get rave reviews and actually feel embarrassed when I get asked for the recipe because it is so simple and delicious. Here’s the clincher…are you ready? It is low calorie. Weight Watchers would deem this 2 points a cup without chicken added and 4 points with it. 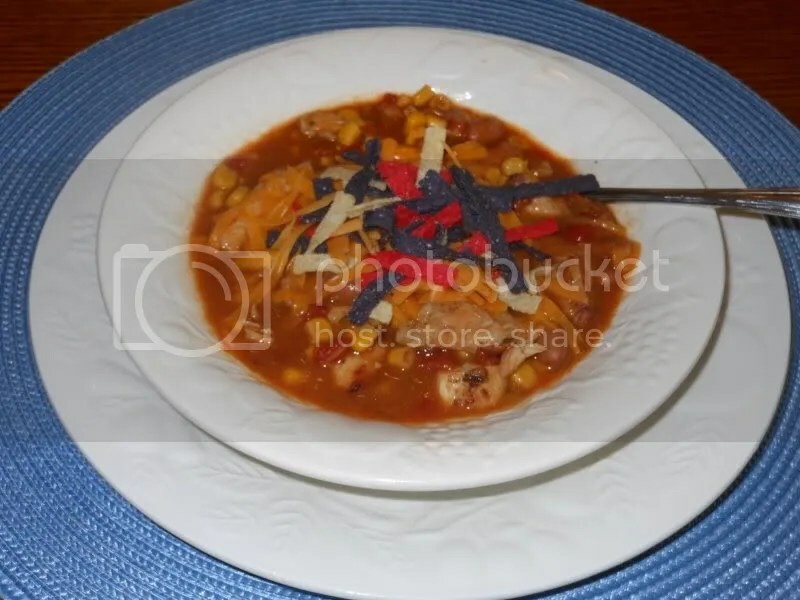 This is not low carb as you can tell because of the beans and corn. In this case, it was rainy and the wind was bellowing outside so I made this for lunch and had leftovers for supper. I don’t know if I have mentioned that I home school and cook at least twice a day. That’s why it’s my secret weapon. Don’t laugh or be discouraged when you see the ingredients…it has a wonderful flavor and your guests will be asking for the recipe. It’s a promise. Get a pot. Open the cans. Tear the packets. Add it all. Stir it all. Bring to boil. Turn down heat. Simmer until served. That’s it, really, that’s it. Try it and tell me what you think. Previous Post Hermann’s: What’s New? This recipe sounds great. I have printed it; now only to cook it. Let me know how you like it. Thanks for commenting.